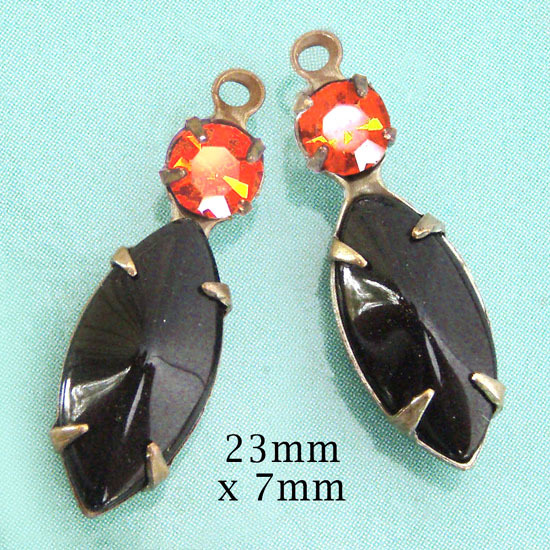 Black and orange jewels – Happy Halloween! I can’t believe I hadn’t thought of this – a customer asked me to put together this combination of glass jewels and I think they are so cool! It’s a little late to order them for Halloween this year – but hey, they’d be fun anytime. But I’ll def. remember this for next year – orange and black, black and orange, because Halloween is maybe the most fun holiday all year! Here’s a pretty example of how you can combine a sparkling glass bead or jewel with a silver plated “ornament” (filigree, stamping, or charm) and make a fabulous pair of earrings – with very little effort! The silver filigrees are actually silver plated over brass – it’s good quality plating but much more affordable than solid sterling silver – and the style is modern and chic. 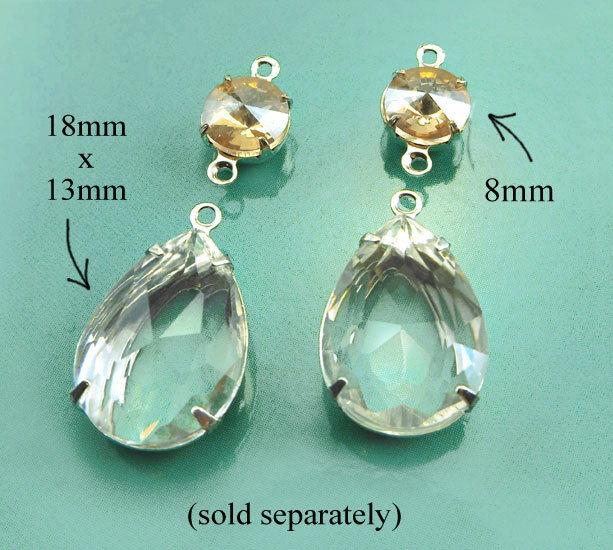 The earring jewels are about 5/8″ high (the earrings are a bit under 2″ long, in total) – they’ve got a lot of presence but are still very lightweight and comfy (I’m very fond of comfy). 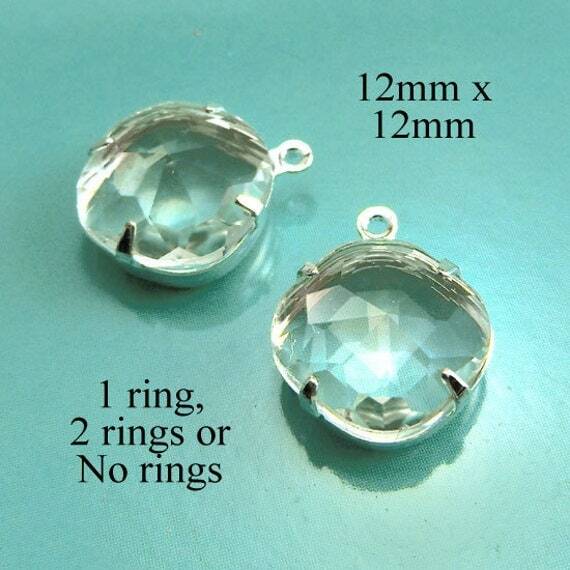 The components are available in my jewelry supplies shop but if you don’t see them, just send me a note and ask! 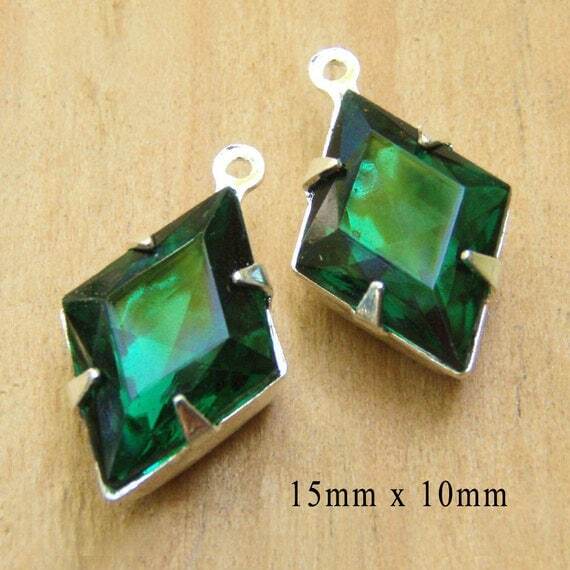 Emerald glass gems – love this diamond jewel shape! Aren’t those lovely? 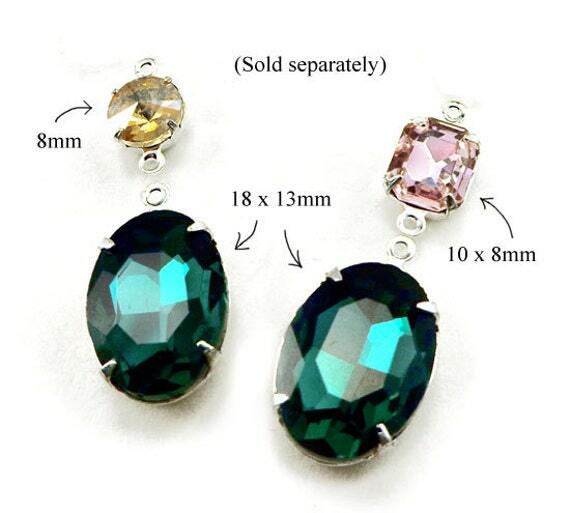 Totally great for Christmas earrings – or holiday parties – or May birthstones (because emerald. You know.) But they don’t cost like emeralds – they’re glass. They didn’t mess up the earth when they were dug up – and they won’t mess up your wallet, either. You know that brown is one of the important colors this fall. 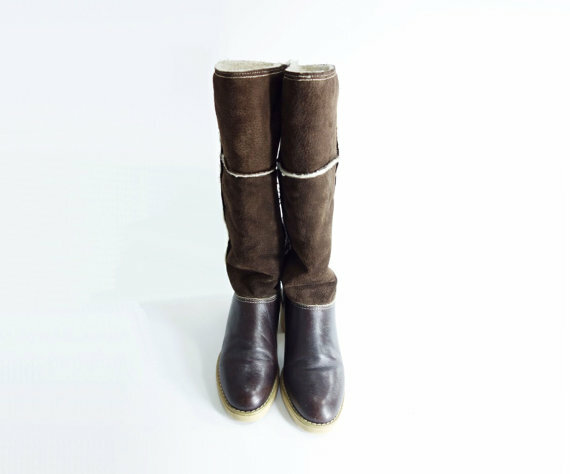 And these are GOOD boots. Probably better made than their brand-new counterparts (certainly for the uber reasonable price of $74 plus shipping). And they’re distinctive enough that you aren’t going to see them everywhere you go. 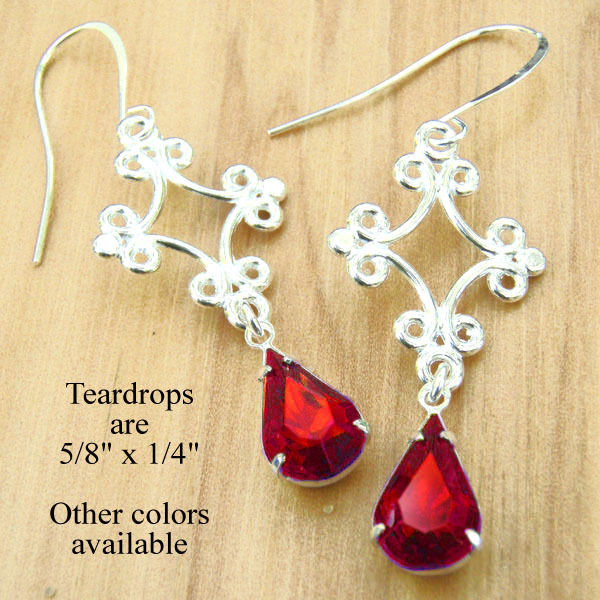 I’d wear them with jeans, with dresses, with skirts – but honestly they are just made to go with a short skirt. Okay, plus tights – it’ll be winter soon. Make that a very short skirt. You know you’ll look great! I found this treasure at Starlet Vintage, a darling vintage boutique on Etsy. Joanne, the shop owner/curator, has a great eye – and she gives you the detailed info and clear pics you need to make a good buying decision. Go there. You’ll thank me. And if these boots are your size? I think you’re going to be a very happy shopper. This is a win! But not right now. Right now I wanted to show you a quick idea. A clear jewel – no color at all – just a bit of sparkle. Add a bit of color. Voila: new combo. These are really pretty together. And would be great for the holidays – night or day. They’d complement your outfit, without shouting (you’ll try other combos, for that). And they’ll look good. Buy, or scrounge, or thrift, or swap, so you’ve got a few neutral bases (like these clear teardrops) – then add fun little bits to them. Instant jewelry wardrobe for not much money or work. Vintage Top and Skirt Set, and Wowza! Now this is a killer outfit! This hot little number is a top and skirt set, 1960s vintage, good for year-round wear (okay, maybe not the hottest summer days, but otherwise). Plus size for curvy girls. And it will take you ANYWHERE. I found this star at Luvsick Vintage and you totally want to go there. The shop owner, Britteny, gives you good clear pics and the info you need to make smart online purchases. Like I said, anywhere anytime, this will work for you. You need this outfit! 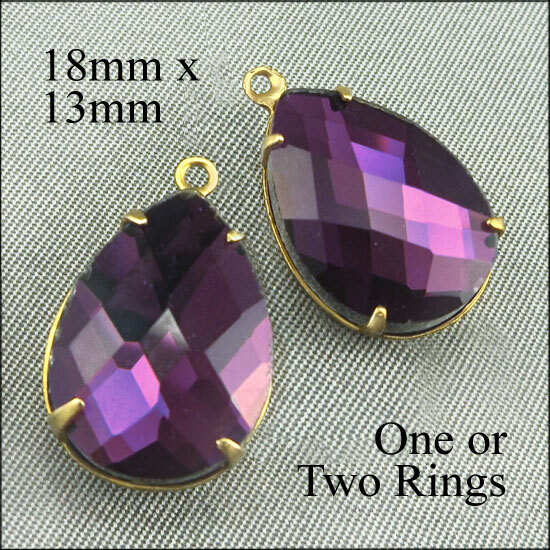 I have to confess: I got these gorgeous amethyst glass teardrop cabochons by accident. They aren’t the ones I ordered – and now I’m hoping I can get (a lot) more. They are beautiful! The vendor was supposed to send me smaller square amethyst beads. These came instead. And I’ve already asked them to send me more. Cross your fingers! And they go with everything. 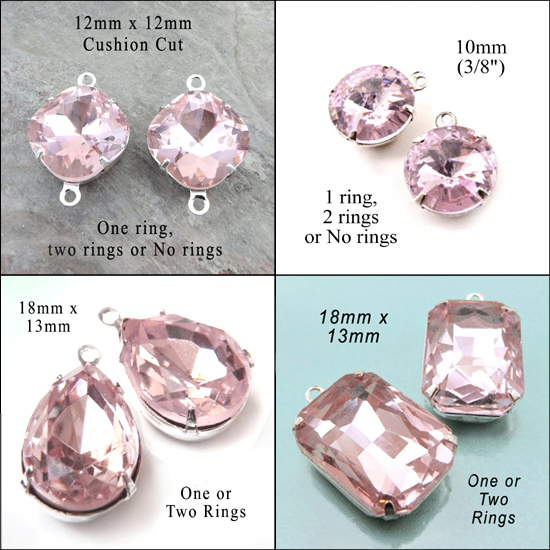 I recently got in a large packet of these adorable clear glass cushion cut beads – so I can offer them at a great price. They have no color at all – but somehow, the gentle glow or sparkle (depending on the setting) can make them the “Little Black Dress” of your jewelry collection. You don’t look like you’re trying too hard – but you’re wearing a chic little pair of earrings or minimalist pendant that you can wear anywhere, anytime.